Solon Firefighters with new equipment. (L to R) FF Rich Hays, FF Jordan Nielsen, FF Matt Schievink, FF Scott Johnson, Captain Doug Gabrielse, FF Jack Schmidt, FF Taylor Hunt, Deputy Chief Chris Paige. 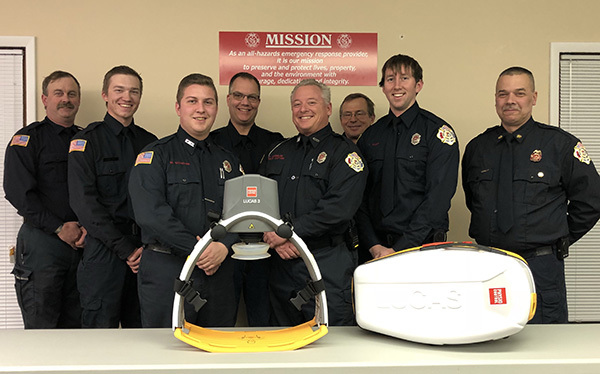 In October, the Solon Fire Department was awarded the purchase of an Automatic Chest Compression Device through the generosity of the Firehouse Subs Community Foundation. Solon Fire Chief Jeff Drake said that this equipment recently arrived at Solon Fire Department, and that fire personnel completed the manufacturer’s recommended training. “We have added this equipment to our cache of tools to provide quality service to our customers,” said Drake. He told the Post that this grant would enable SFD to provide high performance cardiac arrest treatment with three personnel versus the current need for optimally six persons rotating and performing manual compressions. It will give SFD the ability to deliver better CPR and provide a greater likelihood of patient survival.